I finished this one up last night. The Blue Anchor is at such a wonderful location, in the crossroads town of Twin Bridges, Montana. Standing on the bridge, with that deep perspective of the road, the mountains tower, blue, over the bar. It’s an elegant building, simple and strong, with enough intricate brickwork to show the kind of craftsmanship that was in the area some hundred plus years ago. You notice things staring a a building for hours when doing a painting that you wouldn’t otherwise. The window spacing, for instance, is off on one side of this building from the other. I haven’t been able to find historical photos going far enough back, but my guess is that the building was originally just the one side up to the center window, and that the other side was added on later and trimmed to bring the entire building together. Usually in that case, there will be differences in the coloration of the brick, like when they stopped and started on the Washington Monument. But with the harsh Montana sun and likely the same brickmaker and craftsmen working on it, I still have a feeling like this was the case. In the 1930s, the building was updated into more or less what you see today. The ground floor windows were bricked over and re-proportioned, a glorious blue facade was added, along with a full width neon sign, inset glass brick doorways and a huge anchor shaped neon, protruding from the face of the building. The left hand side is a cafe, with a lunch counter and barrel roof straight out of an east coast diner of the 1930s. The right side is a bar, and with the separate entrances, from what I can tell, the two aren’t connected. 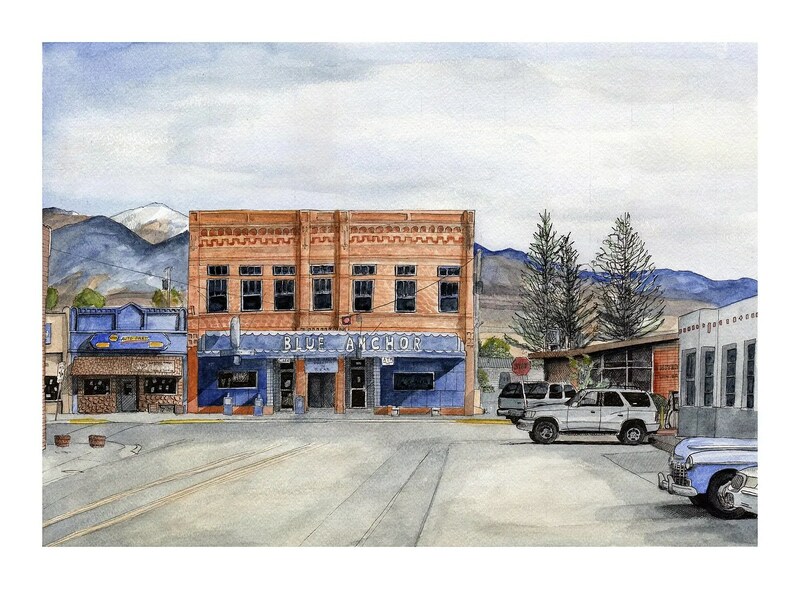 This entry was posted in Diners/ restaurants and tagged Bar, Cafe, drawing, Montana, painting, The Blue Anchor, Twin Bridges, Watercolor by Spencer Stewart. Bookmark the permalink. Spencer- I love this painting. You have a nice style and a good eye. Your Dad told us about your new project. Can’t wait to hear more.